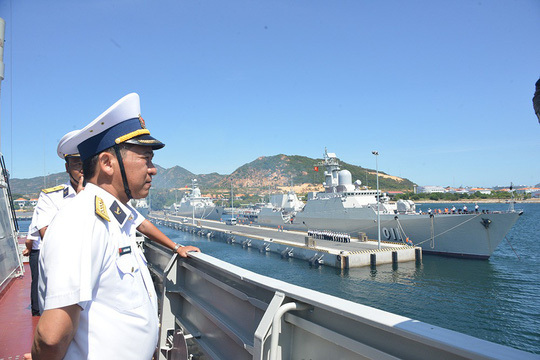 Two Vietnamese frigates have left Cam Ranh Port in the southern central province of Khanh Hoa for China to attend an event to mark the 70th anniversary of the founding of the Chinese Army Navy. The frigates 011-Dinh Tien Hoang and 015-Tran Hung Dao’s visit to China is at the invitation of the Chinese Army Navy. The Vietnamese warships will join naval exchange activities with several foreign countries. The mission led by Colonel Nguyen Dinh Hung, deputy head commander of Navy Region 4 Command, is expected to sharpen the Vietnam-China navy co-operation in order to boost the comprehensive strategic relationship between the two sides. The two warships, Russian built Gepard-class frigate with advanced military equipment, were bought from Russia in 2011. The Gepard-class frigate is equipped with stealth technology, angular shells and radar absorption paint to minimize radar reflectivity upon facing enemy surveillance systems. It is also equipped with jamming and modern electronic warfare systems. Vietnam People’s Navy frigate Tran Hung Dao also docked at Zhanjiang City, Guangdong Province, China, to join the five-day ASEAN-China Maritime Exercise in October last year.